Some artists lead a double life — that’s quite artistically satisfying! During the day, he’s working in the Hollywood animation industry. Born and raised in Athens, Greece, he studied animation at the famed California Institute of the Arts. He has worked as an animator, animation supervisor and storyboard artist for DreamWorks Animation, Warner Bros, Paramount, Sullivan-Bluth and Universal/Illumination. Vakalis was the main pre-production and storyboard artist for the popular ESPN channel series Off Mikes for which he received an Emmy Award. He was also nominated for an Annie award, animation’s highest honor in America, for his work on DreamWorks Animation’s film Bee Movie, voiced and produced by comedian Jerry Seinfeld. His continued long-term working relationship with DreamWorks Animation also includes the films Over the Hedge, Flushed Away, Kung Fu Panda, Monsters vs. Aliens, Puss in Boots, Turbo and numerous others. 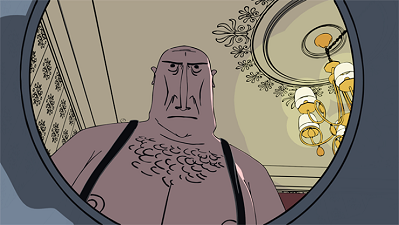 After the international success of his acclaimed animated short film Human Nature. 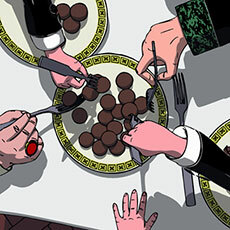 Nassos Vakalis brings onto the screen another original animated story Dinner For Few, an animated 3D short film with a deeper, darker and more ambitious subject matter. 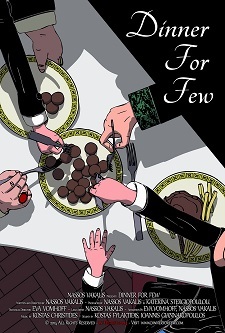 Inspired by the economic recession that shook Southern Europe, Dinner for Few depicts a sociopolitical allegory of modern society. During dinner, ‘the system’ works like a well-oiled machine; feeding only the select few who sit at the table, while the majority survive on the scraps tossed aside. The more the elite consume, the more they diminish everyone’s resources. Inevitably, when the supply is depleted, the battle for what remains leads to catastrophic change. Sadly, the offspring of this profound transition turns out not to be a sign of hope, but the spitting image of the parents. 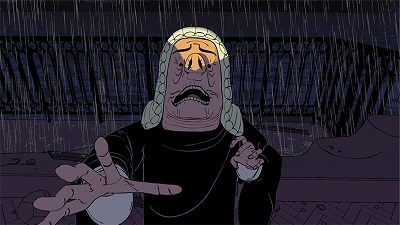 Vakalis wrote, directed and animated the 10-minute film which was produced in the U.S. and his native Greece. He also brought in German-based Eva Vomhoff for technical and artistic collaboration, producer Katerina Stergiopoulou and composer Kostas Christides to create the original score which is performed by the Bratislava Symphonic Orchestra. AnimatedViews: Do you consider yourself as a pessimist or an optimist? Nassos Vakalis: I consider myself a realistic person. Unfortunately, reality sometimes is not pleasant. In the case of my film, what I’m trying to depict is a sad reality. This maybe makes the film look pessimistic but in truth, this is the nature of the world we live in right now. Digging deeper into the story, someone will say that there are parts of the film that I see with a more positive and optimistic eye. Most of the film is taking place during a rainy stormy night. Nevertheless, at some point towards the end the clouds do part aside, the rain and thundering stops and a nice bluish moon casts its light on the characters as humanity is presented with a new chance to improve itself, taking a step over the threshold of a new better world. This is the great challenge ahead of us. The old has perished and the new is being born. The chance or the choice is always there for the world to wake up wiser, realizing the old mistakes and trying not to repeat them again. Consequently, although things end up differently in the film there will always be another chance and the hope that the world might be ready to take advantage of it next time. AV: How did you build your film on the metaphorical level? NV: The initial idea was the cats trying to feed themselves from the pieces that people throw off a table. This is a very familiar image for Greeks since they have these outdoor “tavernas” during the summer. I have been in this kind of places many times myself. One day I was talking on the phone with a friend about the economic crisis in Southern Europe and especially in Greece and I wondered if the people would eventually become like the “taverna” cats. When these cats have nothing more to eat from the table drops, they eventually start jumping on the tables and steal the food from the plates of the dining patrons. The question was if people would do something similar and try to claim anything and with what means. So, this was the core idea on which I based the story. The metaphor worked pretty well and soon I realized I could make it into a short movie. The story was also open to elaboration so while writing the treatment I added other ideas like the situation under the table for example, and figured out the ending of the story. 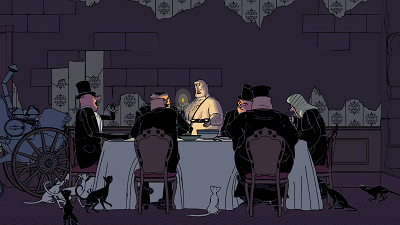 Initially I had other ideas about the look of the characters eating at the table and consuming the wealth. However, I was not happy with a human look and I wanted something more surreal. I remembered the animated John Halas film “Animal Farm” and felt that the similarity dictated the characters to be anthropomorphic pigs. 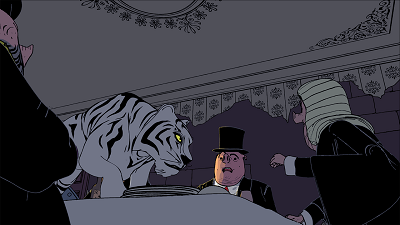 I wanted the design to be more realistic and “hard” around the edges so I developed this flat 2D look, which resembles a French graphic novel look. Later I was researching similar themes trying to see what else could inspire me further and my eye caught the Bertolt Brecht poem From A German War Primer. While reading it I noticed this verse, “Those who eat their fill speak to the hungry of wonderful times to come.” Which I felt could be a great intro to my film, specially setting up the tone, so I used it. AV: Who/what is the servant? NV: This is probably the one single question I’m always asked regarding the film characters. On one hand, we have the cats, which represent the average people living their lives, trying to survive in the structure of the world. 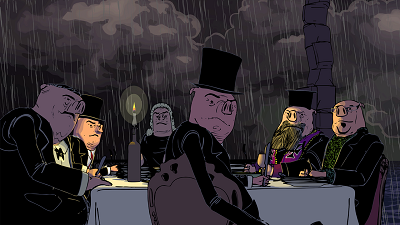 On the other hand, we have the anthropomorphic pigs sitting at the table. They consume the wealth of the world leaving little to the cats. As powerful as this cast of “selects” may look like, they are not the masters of the game either. They do appear to enjoy the wealth but the wealth is served to them by a servant who is the one who selects whom to feed and when. On their own, the pigs can only reach the food on the table. This servant, who I call the butcher, is designed to look like an executioner. He is the “system” that allows and prolongs the unfair distribution of wealth while serving only the few and ignoring the many. Surly something like that is open to many interpretations and most people will identify the butcher with a certain political system or certain kind of political government. But to me, it is not the type of the “system” or “government” that interests me the most but rather its failure to function as promised in whatever form it is manifested. The fact that at the end it always becomes a short of an executioner. From the beginning of time, through the ages, the rise of the Greek city states and democracies, Plato’s writings of the ideal republic, the Enlightenment, the American constitution to the countless Revolutions of so many nations, the outcome seems to be one and the same; a few eat and the rest struggle to survive. This is not just a failure of a fair government it’s a failure of humanity itself. For this reason, the butcher character is the only human character in the film. He is human because he represents the human intellect trying to rise above and control the instincts of the animal within, as it is manifested in the film with its only care to foolishly consume. AV: In what way do you consider animation a way to convey political and sociological ideas? NV: I’m sure animation is not the only vehicle to say such a story. Certainly, it is one with the fewest limitations, and I think the method of telling the story through a metaphor is what serves it the best. Like myths, metaphorical stories tend to give the audience a freedom. There is no right or wrong but rather an interpretation of what you see or hear trying to put it together in a form that makes sense to you and not necessarily to someone else. Animation can certainly give an extra dimension to the experience since it can have the surreal element with little cost in resources. If a specific graphic style is selected, then it can add to the effect. In my story, I wanted to have a very surreal and graphic tone throughout the film and I could not see how I could achieve that with any other medium. AV: What do you think about that tendency now for animators to take their distances from pure entertainment and studio system to express ideas through their art? NV: Animators always wanted to explore paths beyond the studio mainstream safe zone. I think in Europe or Japan this has been certainly the case but even in the USA, we have some examples of feature films that look for a different audience. Therefore, while in the USA we have films exploring more adult themes; like the films of Ralph Bakshi or some of the prime time TV animation shows, in Europe there is a greatest selection of films with political, social, and other allegorical themes, which unfortunately the mainstream American distribution channels prefer to ignore. Occasionally some films from Japan seem to enjoy a better reception in the US. Nevertheless no domestic or foreign animation, other than a purely action adventure entertainment created by a major studio, receives a wide distribution deal. The situation is even worse for the short films. While there is a larger production volume with many films taking on controversial or adult subjects, such films in the lack of any distribution deal or any other marketability find an audience only while circulating on the various film festival venues. Unfortunately, even these films nowadays might receive even less exposure. Big studios are now producing short films “advertisements”, campaigns of their upcoming feature films, usually featuring the same well-known characters. So with the major studios offering unlimited advertising, sponsoring money to the various venues and cutting edge technological resources and innovations it has become even tougher for an independent film to receive exposure, recognition or award votes. AV: How do you articulate your experience at Dreamworks Animation and your freelance work? NV: One part of the problem was to balance the workload. 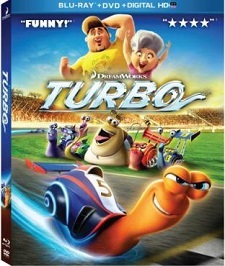 During the weekdays, I had my work at the studio; most of it was during the production of Turbo which was the project I was assigned at DreamWorks. After DreamWorks, I returned home and spent some hours with the kids who were born just a year before I started Dinner For Few. When the kids went to bed around 8:30 pm I would sit down and try to work on the film and sometimes I went to bed as late as 3:30 am, trying to either finish a scene or solve some technical problem. I kept this schedule for about 2 and half years with very little deviation. If you ask me about the experience, I would say it was very rewarding because I had the opportunity to work on something different and put some of my own ideas out on the screen. What I’m trying to say is that the day job sometimes is like a routine. 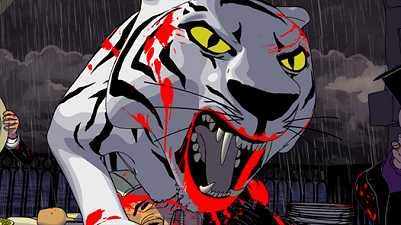 I for example work on the story department mainly drawing storyboards and working on action sequence cinematography. Storyboarding has a very creative aspect but it is only in the visualization of the ideas, the ideas themselves are often written on a script page and there is little change a story artist can implement. This is part of the job though and we all know it. There are some occasions on which we have the opportunity to present some of our own ideas or more often, I would say board them and see if they fly with the director, but most of the time we have to stick to the script and see what we can do with that. The personal project obviously is the complete opposite. It is free blank canvas where you, as a director, can do whatever you feel is appropriate without the studio guiding your work. This is a freedom you only have while working on your own project. AV: The technique you used is computer animation but through toon shading, which transforms 3D elements into flat images. Would you explain this choice, instead of appealing to hand-drawn animation, that’s naturally flat? NV: It was a practical choice. I knew I wanted the flat graphic look you are referring to and I knew there was only two ways to achieve it. One, as you said, was to try and hand-draw the animation. My friend Len Simon who is a brilliant 2D animator insisted that this is what I should be doing anyway. He had seen the animatics and his response was that I only needed to put some extra poses and in-between the drawings and I had the movie. Well I think it’s easier said than done. Besides the actual hand-draw animation there are a number of other stages in the 3D animation production that require a specialized crew of many people. I had no clean-up crew, no in-betweeners, no ink and paint software or even people to do the job. I had no idea where to even look for these people since there is very little 2D production happening now days and even if I could find them there was no budget to pay them. On the contrary, 3D animation looked easier and more practical. I had the experience of completing a shorter film two years prior and it seemed at the moment I could repeat what had done easily. As far as the look, I had found a method of using the toon-shading plug-in that appealed to me. Through a set of Photoshop actions, I was able to take the technical wire line generated by the plug-in and flare it creating a thick and thin quality that gave my drawings a sketchy appearance. At the same time, I created a set of rules that gave the animation a choppier look and designed a pipeline to run the full production through it. Most of the times this pipeline worked as expected but there were a few occasions that I had to spend a great deal of time solving unexpected technical issues. In the end, the style I achieved does look the way I had envisioned it and for this, I feel I have chosen the right technique. AV: How did you manage your crew, from US to Greece and Germany? NV: Dinner For Few had a very small crew. For the visual part, the film only had two artists, me and Eva Vomhoff from Germany. Eva joined the crew when I was looking for some information about a plug-in. She was referred to me by the plug-in developer as the person who has written some great comprehensive tutorials. I showed her what I was doing and she liked the project and volunteered her help. She rigged all the characters, worked on all the models and did some of the best animation on the film. Working with her was extremely easy because she was very professional, methodical and had great attention to the detail. She is probably the best help I have ever had on anything I worked on and I hope we have the opportunity to work on something again. The sound part of the film had two teams, the sound design team and the music team. For the sound design of the film, I chose Tone Studio in Greece, which has great experience doing sound design in various films and projects in Greece. I sent them a rough sound design track I had created as a guide and they built their own tracks according to that. We did a number of passes where they would send me their tracks and I would give them some notes or pointers on the effects and some of the animal sounds. 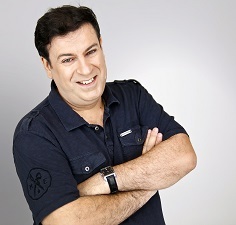 Kostas Fylactidis, the owner of the studio, paid a lot of attention trying to get the “atmospheric ambiance” of the room environment throughout the film. Meanwhile, Kostas Christides was working on his music score. Kostas first did a temp score for the film using music clips of some of his previous work in horror films for a thematic approach to the music. When I felt comfortable with that, he told me he wanted to do something different and more orchestral and pushed for a live orchestra recording. To be honest to you, I liked the idea and Kostas took it upon himself to deal with all the issues related to booking the orchestra, supervising the performance, mixing the different parts, and delivering to me the final piece. Finally, Kostas Fylactidis mixed his sound effects with the music in a 5.1 surround track. The overall sound production took a little longer that I expected but the complexity of the work needed the extra time and it was definitely worth the cost of it. AV: Can you tell me about your repeated collaboration with composer Kostas Christides? NV: Kostas Christides is an amazing composer. This is the fourth time we collaborate and I feel this time has topped himself. When I first met him in 1996, he was just out of his USC studies doing orchestrations for Chris Young. I was not doing any projects at the time but he insisted giving me a CD with his work to listen. I was amazed. Especially I noted a music piece he wrote as his final school project; an Olympic Games hymn. I told him if I ever got a chance to do anything of my own, I would let him take care of the music. Since then, a lot of things have changed but we finally got the chance to work for the first time in 2006 on a series of animated shorts I was writing and directing for the internet. I found he was able to capture the tone of my work and even enhance it with his music. His musical composition was not just a cover or a wrapping paper over my animation but part of the whole experience while emphasizing the different layers of emotion, drama, or even action. Special note though I should give to him about his music for Dinner For Few. He didn’t only write an amazing orchestral score but took it upon himself to produce the score with a live orchestra in Bratislava over the internet! AV: What do you hope Dinner will bring to the perception of the situation in Greece? And more largely in Western countries? NV: I hope the film first finds its audience. I think this alone is not an easy task because the film is very hard, features some very violent scenes, lots of blood, and as you noted it doesn’t have an optimistic ending. As we said earlier, there is very little exposure for a short film anyway so I contacted a few media and a number of Greek printed and online publications that have shown some interest on the film who wrote positive reviews and articles about it. At the same time, I’m submitting it to as many film festivals as I can. I hope through these festivals people will see my film and try to connect with it. Understanding and interpreting the metaphor is the first important step. The metaphor allows people to think and thinking is part of the road that leads to any kind of change. My attempt is not to take a certain political view favoring one political system against another; this is why I have two politicians on the table wearing different colored ties. My goal is to point out, through my visuals and allegorical storytelling that our nature as human beings is flawed. It is forcing us to repeat ourselves and our own mistakes. Possibly the only salvation and freedom will come to us only if we find a way to overcome this vicious cycle and evolve beyond the limitations of our own flawed sociopolitical systems. Be sure to watch the Dinner for Few trailer here, on the movie’s website. With our thanks to Nassos Vakalis and Cinzia Angelini !